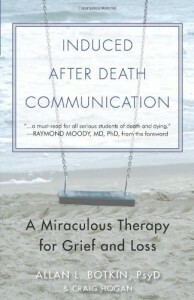 I’m writing about a new therapy for grief & mourning called the Induced After Death Communication or IADC. I’ve previously written about EMDR Therapy, the psychotherapeutic approach originally developed as a rapid and curative treatment for Post-Traumatic Stress Disorder or PTSD. Since its development in the early 1990s the use of EMDR Therapy has been expanded as clinicians applied the process to other issues. One such adaptation of EMDR Therapy is a treatment for unresolved grief called the Induced After Death Communication or IADC. This technique, pioneered in 1995 by Veteran’s Administration Psychologist, Allan L. Botkin, Psy.D, uses a variant of the EMDR Therapy procedure to induce a state of mind where the client or patient becomes receptive to the phenomenon commonly referred to as the ADC or After Death Communication. This term was coined by Guggenheim and Guggenheim in their book Hello from Heaven and shares common ground with the term NDE or Near Death Experience written about by Raymond Moody, MD in his book Life After Life. According to these authors these phenomena are reported by about 20 percent of the population. They are most typically random and spontaneous events and often involve a vivid and life changing contact with a deceased person with whom they have had some relationship even if only casual. These ADCs are not considered hallucinations. They occur regardless of a person’s religious or spiritual belief or lack thereof. Dr. Botkin observed this ADC phenomenon while using EMDR Therapy with his patients at the Veteran’s Administration hospital in . They were reporting vivid experiences involving encounters with friends and comrades who had died in the Vietnam War. These experiences were uniformly positive, unexpected and resulted is a significant improvement in their psychological symptoms. Because of this, Botkin set out to see if he could reproduce the phenomenon. He found that by varying the EMDR Therapy protocol typically used to treat PTSD he increased the likelihood that his patients would have an ADC. He called this process the Induced After Death Communication. Botkin noted that the emotions of guilt and anger served as distractions which keep patients from reaching, releasing and healing from their deepest ‘core’ sadness. When the deepest sadness is not reached, the patient or client does not tend to resolve their grief in a satisfactory manner. To help his patients, Botkin developed Core Focused EMDR Therapy a modification of the standard EMDR Therapy procedures. Core Focused EMDR is directed at Core sadness instead of following the standard EMDR Therapy process where the client is following whatever comes up. For Botkin the result was a greater increase in the likelihood that the ADC would occur. Since the discovery of the Induced-ADC Botkin has repeated the procedure thousands of times with success. He has also began training other EMDR Therapy trained, licensed mental health clinicians, how to do the IADC procedure. I heard about Botkin’s book and read it shortly after it was published in 2005. I was curious enough after reading his book to seek him out and he taught me the IADC procedure. 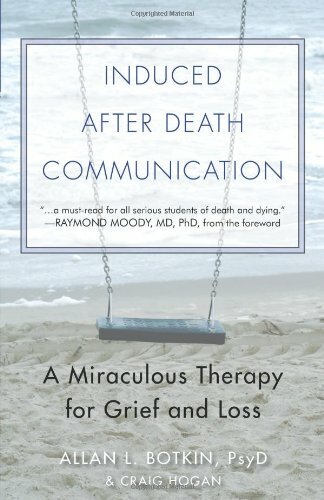 If you are interested in learning more about Induced After Death Communication Therapy I suggest you read Dr. Botkin’s book. If you are curious about attempting an IADC I’d be happy to discuss it with you. Here are some things to consider if you want to try the IADC. 1. The IADC process does not always result in an IADC – Dr. Botkin notes that he has a very high success rate among his inpatient population and about a 70 percent rate of induction when attempted on an outpatient basis. I’m living proof that it does not always work: I was unsuccessful myself when, during my training, Dr. Bokin tried but could not induce the ADC in me. There are however other positive benefits from the therapy even if the IADC is unsuccessful. 2. Trying and expecting tend to get in the way – Unfortunately, the natural response for many of us is to try to make this experience happen. Likewise, IADCs consistently seem to defy the expectations of the one having the experience. Therefore, we speak about ‘inducing’ the receptive mode where the client is open to the experience in whatever fashion it may show itself. That can be a hard one for those of us who might want badly for it to happen or have a preconceived notion of how an ADC should happen. 3. Prior history of untreated trauma – There are certain aspects of Core Focused EMDR that can bring to the surface of consciousness past traumas that have not been resolved. These tend to interfere with the IADC process and usually require resolution prior to a successful IADC. Your therapist will gather information to screen for such a prior history and can refer you for appropriate treatment if this is the case. 4. Certain medications and untreated depression – Certain medications and untreated depression can blunt emotions and interfere with reaching core sadness. This will interfere with the IADC process. 5. Recent loss – Accessing core sadness in close proximity to a recent death is usually not recommended. The denial and psychological numbing that is commonly experienced close to a death serves an important function. Immediately following a death, that raw emotion can be so sharp that it can impair your ability to function. It can also be an inhibitor to the IADC. Because the rawness of the core sadness must be tolerated in order to have an IADC, I recommend that you allow at least 6 month to a year following your loss before attempting the IADC. This gives your nervous system and your memory time to begin to make sense of what has happened to you and improves the chance that you will have a successful IADC. 6. Benefits from the IADC procedure with or without a successful IADC – While the goal of our sessions would be to help you have a successful IADC that does not always happen. However, there are typically very positive byproducts of EMDR and Core Focused EMDR. 1.) You may have better understanding of the meaning of your loss which is an essential part of healthy grief. 2.) You may find that strong emotion related to your loss has been desensitized. 3.) You may identify issues, of which you were unaware, that are negatively affecting your life. These issues can now be more directly faced if you so choose. 7. The IADC procedure evokes strong emotion – In order to maximize the chances that you will experience an ADC you must be willing to approach and tolerate strong emotions – especially very deep sadness – without trying to control them. If you find that you tend to avoid strong emotion or on the other hand that you get lost in emotion and are unable maintain a sense of the here and now when feeling them, the IADC is probably not a good therapeutic option for you at this time. 8. Experiencing the IADC if I’m not in an acute grief or feeling sad – The IADC was developed as a treatment for unresolved grief. However it is still often effective even if you are not “feeling sad” or “grieving”. In other words, there are people who are not having psychological symptoms or emotional problems that may stem from an unresolved grief but want to have and IADC. People like me who were just curious about this phenomenon and wanted to try and experience it. 9. What type of commitment is involved? – I generally schedule meetings for an IADC. Following a brief telephone interview, I schedule two 100 minute sessions for an Induced After Death Communication or IADC . The first session is to work with Core Focused EMDR on Core Sadness related to your loss. The second session is to finish any of the Core Focused EMDR issues and attempt to induce the ADC. A third session of 50 to 100 minutes is scheduled, if indicated, to address any issues that arose related to the IADC process. Whenever possible the 2 initial sessions should be scheduled on consecutive days with the 3rd / follow-up meeting within a few days to a weeks after.